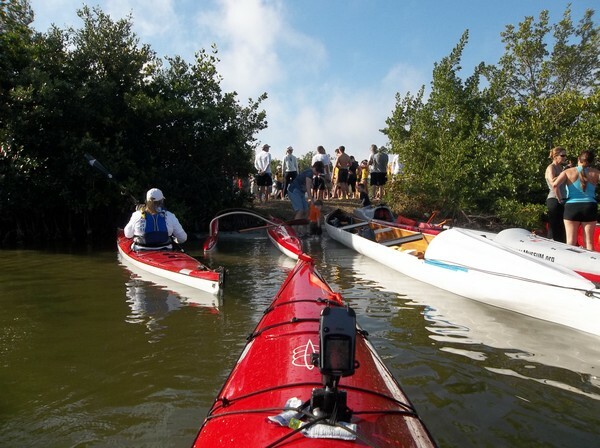 We are always looking for a good kayak Race! Not always so, at one time it was fishing every weekend-weather permitting. However once we made the decision to enter the Missouri River MR340 we found that the local races were a way to get in a little practice. None of the races were near long enough to actually train for the MR340 in the physical sense, but perhaps a little in the way of mental preparation for racing and the opportunity to do a little sprint paddling. "Up the river with a Paddle" race. 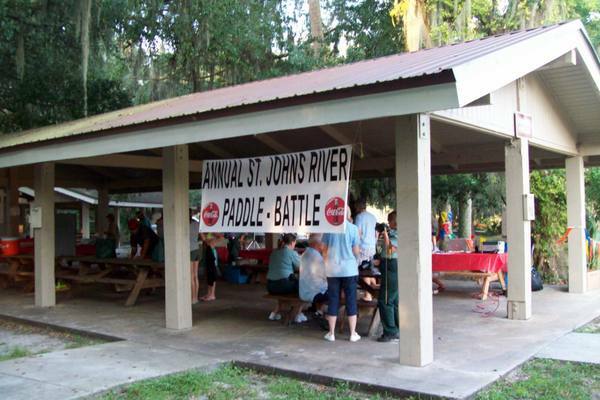 A relatively short fun race up the Sebastian River. My wife and I actually took first place in the solo men's and Women's division. --Which sort of tells you the quality of the competition. First place will never happen again and nor do we expect that. 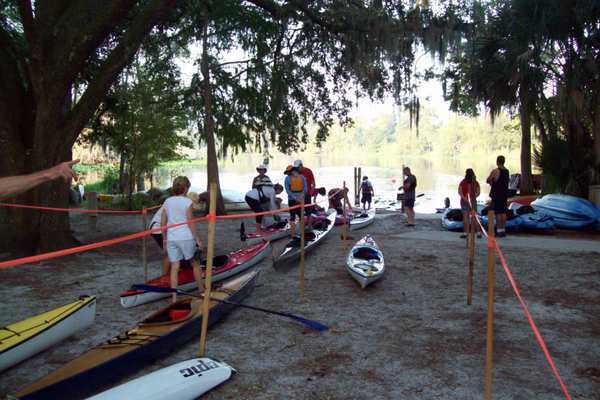 Another quick & short race that was open to SUPs, kayaks, surfskis and Dragon/Panama boats. 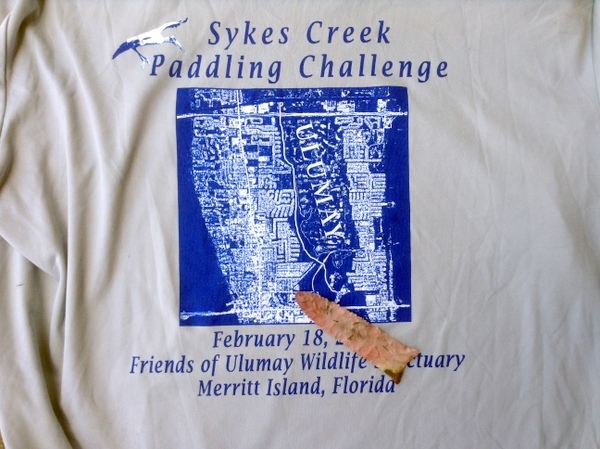 Six mile round trip race up Sykes Creek. So a lot of people avoid these local events. Which is sad. These are fun events. However basically you are making a donation to good causes while having a little race fun. The Paddle Battle is another fun and quick race. Ten Miles around Hontoon Island and Snake Creek or the Birdhouse canal. Mostly kayaks, and rocket fast surfskis. Also available is a six mile race for slower watercraft. The best part of this race is afterwards, take your PFD and float down Blue Springs 'two or three times' until you are freezing! Lining up at the race start! 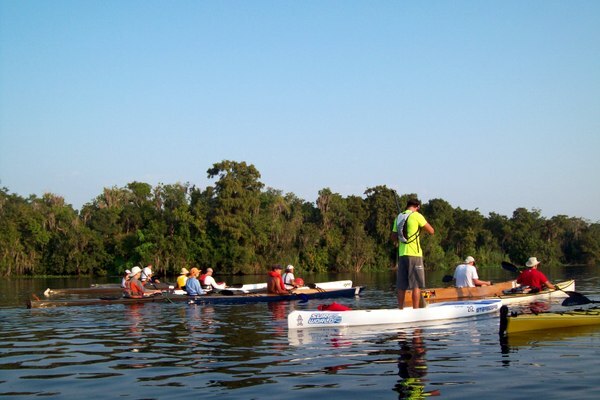 Bird house canal to the St. Johns River before entering the final stretch of open water. 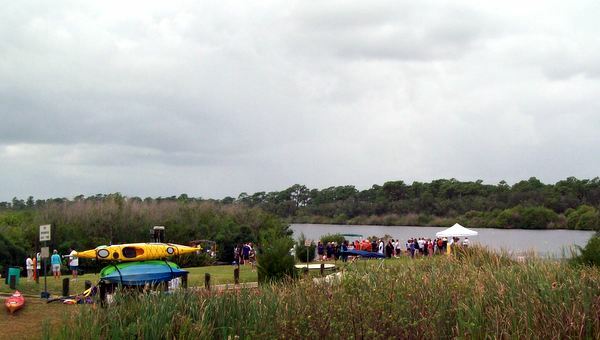 Originally this race was from Cocoa Village (State Road 520) causeway to the 518 causeway and back. 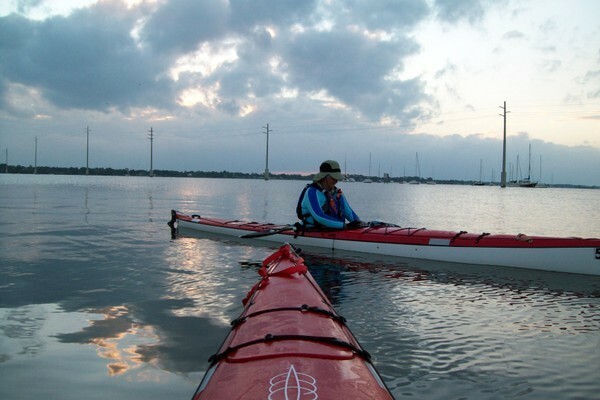 22 miles round trip or 11 miles one way on the open waters of the Indian River. The C2C race is open to ALL paddle craft & is the oldest long distance paddle craft race on East Coast. This is a "Bragging Rights" race & most of the racers are on SUPs. At the C2C race start you cannot even see the distant causeway that is the turnaround point. 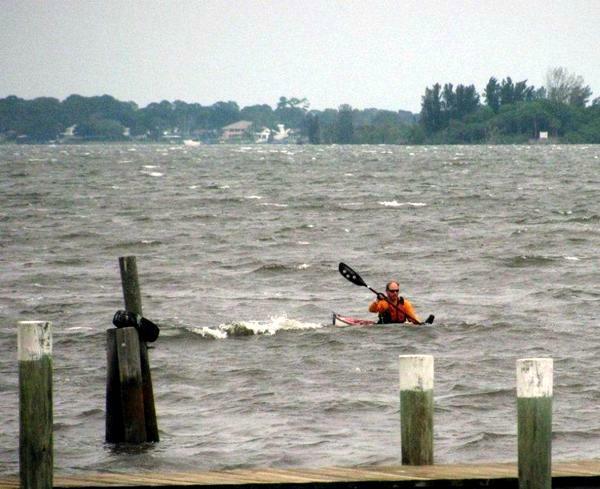 *One race was a no wind day on the Indian River. A photo of me struggling through the Hurricane Sandy wind and waves. Lost my hat when one of the 38 mph wind gusts flipped me over. I used the 'cowboy' kayak re-entry to get back into the kayak. Exciting!!! Would I do that again?......No. With Hurricane Sandy beating up the coast, I geared up for the race, observing the Surf-ski crowd that had signed up for the race because of the hurricane challenge. 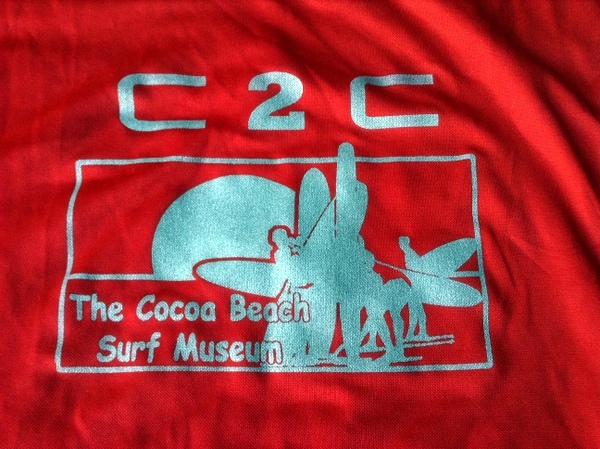 Often the C2C racing crowd is sponsored SUP racers. My wife against her better judgement got in her boat for the race start. Myself- I was all excited. I had surfed my way through the Nor'easter the year before....What could be any different? Or in other words, you make unwise choices in life sometimes. The race horn blew and before we even got out of the sheltered harbor at Cocoa Village one of the Dragon boats was flipped by the wind. I paddled straight for the channel and the biggest waves I could find. In other words, I made about a mile, loving every wave, every splash until quite suddenly I was upside down in brown water. How about a few words on Kayak re-entry? Actually my wife and I had practiced kayak re-entry in a swimming pool. 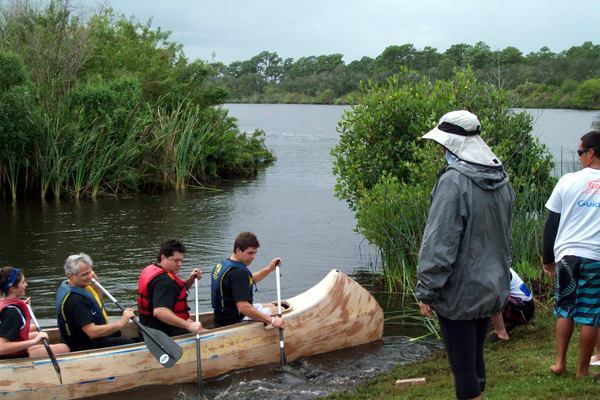 We had practiced with paddle floats but I favored the quicker "Cowboy" re-entry. My thinking was "What if the water is cold and you have to spend all the time setting up the paddle float?" And besides, I felt my expensive wing blade was going to break from the abuse of the paddle float re-entry. The reason why we had practiced re-entry? It was not for any common sense reason. Thank god for the WaterTribe race criteria! 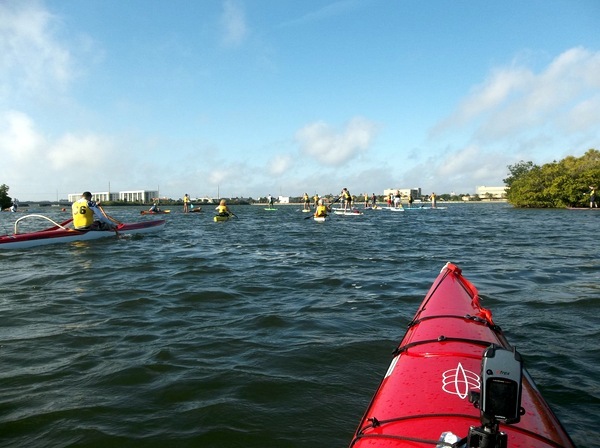 Because on a blustery Hurricane blown kayak race, I emerged from the brown-green foamy water into the Indian River Lagoon, agitated by the wash machine of an angry god. As I had slipped out of my upside down boat I grabbed the kayak and my paddle. Hat was gone forever. The wind still howled, two foot high waves pushed me south towards the distant finish line and I was drifting in the whitewashed intercoastal water way. There might have been small craft advisories if I had bothered to check. I pulled myself to the back of the kayak, put the end between my legs and scooted up the back end. I plopped my backside into the kayak seat with my legs dangling in the water for balance and waited for the right moment (between wind and waves) and quickly tucked my legs into the kayak. 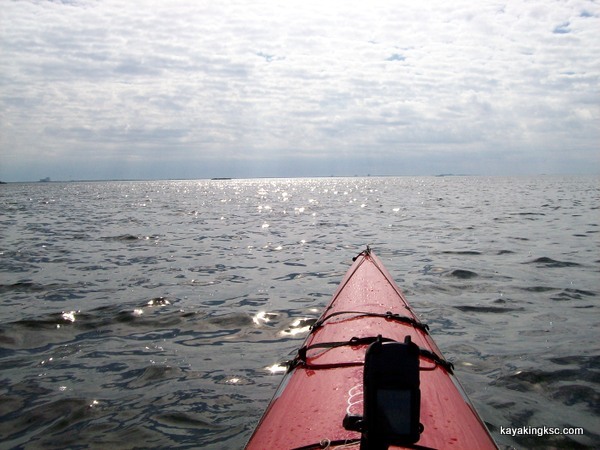 Immediately I began to paddle to avoid being broached by the wind driven wave. Total Kayak re-entry time (in a hurricane) was less than 3o seconds. Couple of factors had made the re-entry quick: I was not yet tired. I was not cold. Perhaps a little helpful was the fact that before I ever considered a kayak, I had loved to windsurf these wash machine days-so there was no panic involved. The next ten miles? Every single paddle stroke was an effort to stay upright. wow. Anyway, Thank you Watertribe for making me practice the kayak re-entry! The WaterTribe races I mentioned? After great study, I decided I would not be able to locate the check points on the west side of Florida.